Raw materials are the inputs which are used for the production of the finished goods and thus it becomes essential for us to check the quality of the inputs before procurement. Thus, our experts do the needful. We have a massive warehouse with Individual stock keeping units (SKUs). We are capable of sorting the products in an efficient way and can easily entertain bulk requirements of the customers. 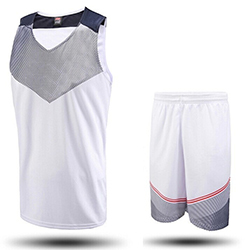 WB-1301 Basketball Uniform has a soft fabric lining with a regular fit design and high durability.